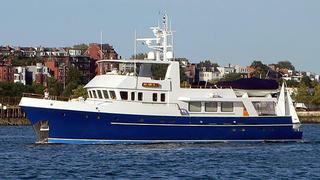 News in overnight of a $500,000 price drop on the 27.4m expedition motor yacht Hope, jointly listed for sale by John DeCaro at All Ocean Yachts and Sean Doyle at Northrop & Johnson. Built by US superyacht yard Palmer Johnson, Hope was launched in 1992 and formerly named Ma Mu IV. The main saloon has a full bar aft with large windows providing extra light, comfortable club armchairs and a desk with a view. The rectangular galley works well at sea and the breakfast nook to starboard is very enticing. Hope can be run by just two crew and accommodates six guests in three staterooms. The master suite is very private below aft of the engine room with a center line king sized bed and there are two twin cabins forward of the engine room. Twin 380hp Caterpillar engines give her a cruising speed of 10 knots and a range of 3,000 nautical miles. Lying in Palm Beach, Florida, Hope is down from $2,950,000 to $2,450,000.